We at Reed Real Estate love our furry animals and we understand the need to bring them on vacation as well. Please be aware of the rules and try to adhere to them. One of the most important ones, of course, is taking care of any “deposits” your pet may leave along our beaches and surrounding areas. Please be sure to clean up after your pet and be courteous of your beach neighbors. Please be aware of the high temperatures when visiting our beaches. 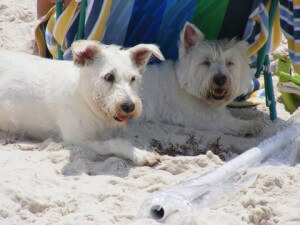 The sand may be hotter than your pets are used to and can burn their paws. Be sure to test the sand temperature before allowing your pets to walk on it. Also, make sure that they don’t get any “sand spurs” caught in their fur or in their paws. We want their vacation, as well as yours, to be pleasant and pain free. In addition, please be aware of the rules and try to adhere to them. One of the most important ones, of course, is taking care of any “deposits” your pet may leave along our beaches and surrounding areas. Please be sure to clean up after your pet and be courteous of your beach neighbors. When your four-footed friend needs a little extra room.